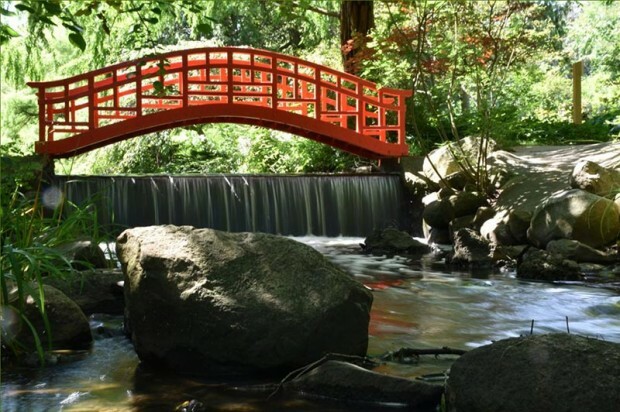 Created in 1915 by Cranbrook founder George Booth and his father, Henry Wood Booth, Cranbrook’s Japanese garden is among the oldest in North America. Although the garden today remains a place of inspiration and renewal for visitors, the space itself needs rejuvenation. With the support of the Consulate General of Japan in Detroit, the Cranbrook Center for Collections and Research has received a grant from the Japanese Ministry of Land, Infrastructure, Transport and Tourism (MLIT) that will start the necessary work. The MLIT grant provided funding to bring six gardeners to Cranbrook from the Japan Federation of Landscape Contractors. Over the course of six days, the gardeners helped transform one corner—the lily pond cascade—into what will once again be a place of beauty and contemplation. This work is the first of a six-phase master plan for the entire garden that is being designed by Sadafumi Uchiyama, garden curator of the famed Portland Japanese garden in Oregon. Boxwood blight, a serious fungal disease that attacks boxwoods, has been detected for the first time in Michigan. The disease was found in Oakland County in three separate locations: a landscape firm, a homeowner’s yard, and holiday wreaths for sale at a retail store. The Michigan Department of Agriculture and Rural Development (MDARD) was also notified by the Wisconsin Department of Agriculture, Trade and Consumer Protection that infected boxwood may have been sold at other retail locations in Michigan. “Boxwood blight is a devastating disease that has caused significant losses to homeowners and the nursery industry in states that already have the disease,” said Gina Alessandri, director of MDARD’s Pesticide and Plant Pest Management Division. Boxwood blight produces dark brown leaf spots and causes rapid defoliation that sometimes kills young boxwoods. Boxwood blight first appeared in the 1990s in the United Kingdom and is now widely distributed in Europe. In the United States, the disease was first found in 2011 in Connecticut, North Carolina and Virginia, and has since spread to more than 24 states. Boxwood blight affects all species of boxwood. However, some species and cultivars are more susceptible than others. American boxwood and English boxwood are highly susceptible. This disease also affects the related shrub sweetbox, as well as pachysandra, a well-known groundcover. Boxwood and pachysandra are commonly used in commercial and residential plantings throughout Michigan. Wreaths displayed outdoors are a potential concern if they are exposed to the elements. The biggest risk comes when people dispose of the infected wreaths after the holidays. MDARD recommends that anyone who has a wreath containing boxwood plant parts should consider it infected and dispose of it by burning or, even better, double-bagging and including it with their trash for deposit in a landfill. Alessandri advised that anyone who suspects that they have plants infected with boxwood blight should contact their local MSU Extension office. David Austin, the rosarian and founder of David Austin Roses Ltd., died in December, 2018 at age 92. Over the past 20 years, U.S. and Canadian gardeners came to know Austin as the creator of beautiful, fragrant English roses. David Austin Jr., son and Managing Director of the company for the last 25 years said, “My father was a remarkable man. His love for the art of rose breeding was truly inspiring; he loved nothing more than seeing the pleasure that his roses gave to others. It is well-known that an outdoor lifestyle with moderate physical activity is linked to longer life, and gardening is an easy way to accomplish both. “If you garden, you’re getting some low-intensity physical activity most days, and you tend to work routinely,” says Buettner. Whether you’re out in the woods or wandering through city streetscapes, keep your eyes open—you may spot one of Michigan’s largest trees! 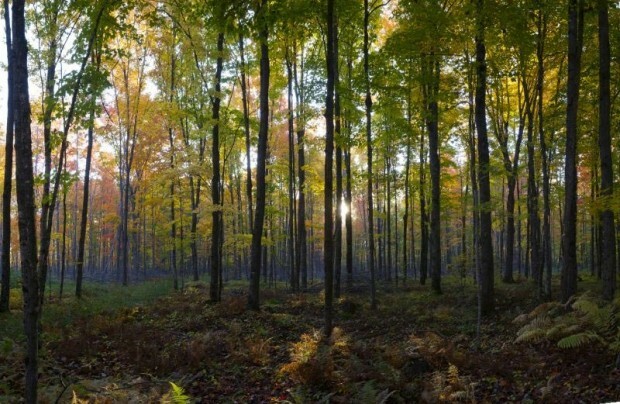 The Big Tree Hunt is one way to discover candidates for the National Register of Big Trees, which so far includes 19 Michigan trees. The biggest tree spotted on the last hunt is a sycamore in Lenawee County with a 315-inch girth. ReLeaf Michigan is a nonprofit group that encourages planting trees. Entries, either online or hard copy, will be accepted until September 3, 2019. Find out how to participate by visiting www.bigtreehunt.com or calling 800-642-7353. Members of Shoreline Herbarist present a ceremonial check for the Michigan 4-H Foundation to Norm Lownds, right, curator of Michigan 4-H Children’s Gardens. The group helped raise funds at the convention through participating in the silent auction and herbal plant sale. During the 2018 Michigan Herb Associates (MHA) spring conference in Lansing, herb enthusiasts from throughout the state celebrated and learned about herbs. Through a silent auction and herbal plant sale, conference attendees raised $3,000 for Michigan 4-H Children’s Gardens. The Michigan State University Department of Horticulture graciously contributed the plants for the auction and sale. 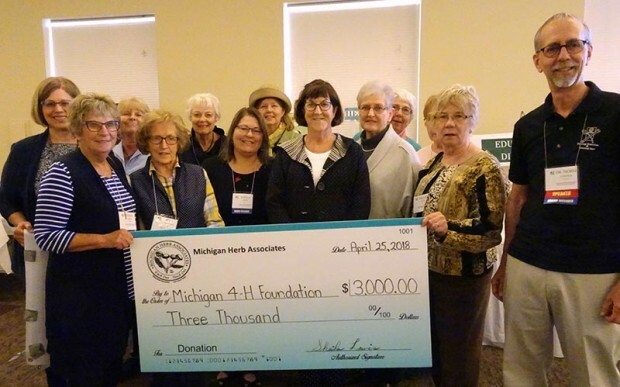 Since its founding in 1987, MHA has donated more than $121,000 to the state’s 4-H Foundation in support of three specialty areas at Michigan 4-H Children’s Gardens: the Peter Rabbit Herb Garden, Garden of Delight, and Herbal Tea Garden. The gardens are located at Michigan State University in East Lansing. Michigan Herb Associates is a statewide organization dedicated to sharing herbal knowledge. To learn more, click here. The North American Japanese Gardens Association (NAJGA) is holding a regional event at Cranbrook Gardens in Bloomfield Hills, Michigan on May 17-19, 2018. This event—”Creation & Rejuvenation: Six Japanese-Style Gardens in Michigan”—brings together garden professionals and hobbyists to explore the challenges and benefits of Japanese gardens in the Midwest using six case studies. Garden tours include the Cranbrook Japanese Garden, Freer House, McGregor Reflecting Pool and Sculpture Gardens, Kathleen and Milton Muelder Japanese Garden, Shigematsu Memorial Garden, The Richard & Helen DeVos Japanese Garden, and Frederik Meijer Gardens and Sculpture Park. Click here for more information. This is the first photograph ever taken of the bizarre and mysterious species. In 1866, an Italian botanist named Odoardo Beccari was scouring through the jungles of Malaysia when he unearthed something truly alien-like: a plant, to be sure, but a plant with no leaves, no chlorophyll, and which did not perform photosynthesis and appeared to live underground. It looked more like a fungus or, perhaps more astutely, an insect or arachnid. Beccari documented the discovery, filing away his illustrations and notes on the new species. And then, nothing. This weird, subterranean plant was never seen or heard from again. That is, until just last year. 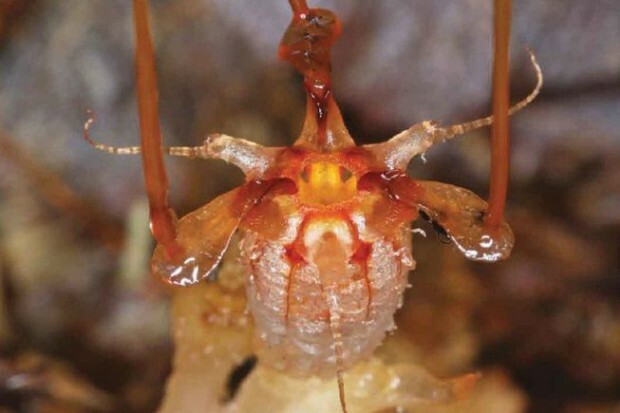 Biologists from the Crop Research Institution in the Czech Republic happened to be exploring the exact same region of rainforest that Beccari had trudged through 151 years prior, when they spotted a bizarre flower poking through the leaf litter. They didn’t know it right away, but they had just rediscovered Beccari’s otherworldly plant. The picture above represents the first time the species has ever been photographed. Three leading Dutch organizations have been collaborating with the aim of making tulip breeding and production faster and more sustainable. Using the latest technologies, it is now possible to identify the DNA sequence of the common garden tulip genome (Tulipa gesneriana), one of the biggest genomes ever sequenced. Its size is estimated to be nearly 11 times larger than that of humans. The tulip genome reveals how the DNA determines the characteristics of a tulip. DNA patterns that are linked to desirable characteristics will soon be used in advanced breeding so that these characteristics can be combined to give new, improved varieties. With this knowledge, new tulip varieties that are resistant to common diseases can be developed faster and in a more targeted way. This will also reduce the use of plant protection products.